So here is the deal. In this alternative history we will suppose that the NCAA and the power five conferences came together before the 1962 college football season to formulate a tournament to determine a distinct national champion. In 1962 the power five conferences were composed of the AAWU (Athletic Association of Western Universities), the Big 8, the Big 10, the SEC, and the Southwest Conference. The system would afford an opportunity for schools in smaller conferences to stand an outside chance to compete. 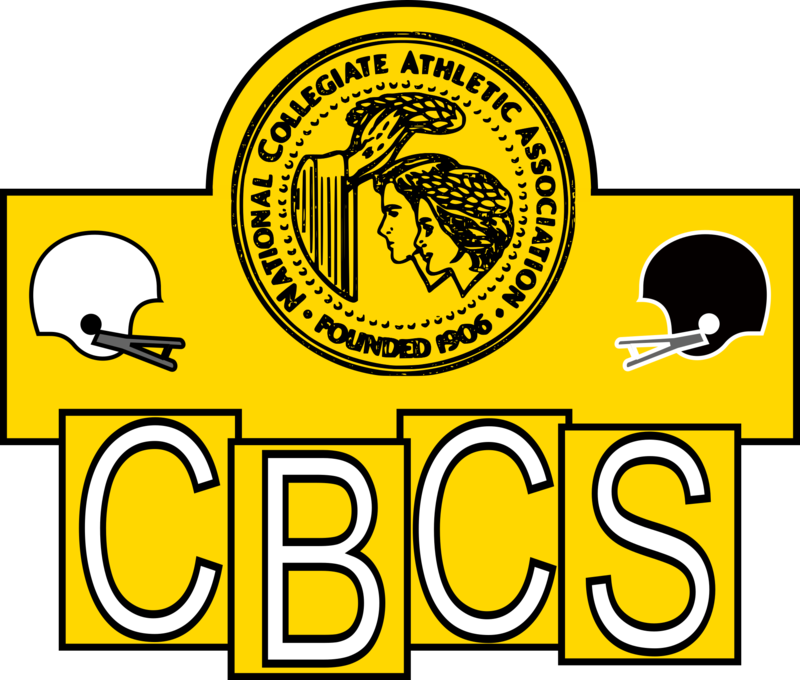 They named the system the College Bowl Championship Series (CBCS). Yes, this is not the BCS but rather the CBCS and it came 36 years before the BCS, but then again in our suspended reality the BCS never happened. So how does it work? Well the tournament consists of 4 rounds; first the conference championship round, second the wild card round, third the bowl semifinals, and fourth the national championship. The first round, the conference championship round, will pit the top two teams in each power conference (or the top in each division if divisions exist in the given conference) against one another in a championship game. The team with the better in conference record will host the game. With 5 power conferences this round will feature 10 different teams playing in 5 games. After the conference championship round a committee made up of coaches (both active and retired), members of the press, school officials, and NCAA officials) will compile one last rankings for the year. The highest ranked team in any top division conference that did not play in a power conference championship game will earn a wild card entry into the playoffs. So technically the second round will feature 6 teams, the five power conference championship winners and the wild card. The top two ranked teams however will get a bye through this round. The four lower ranked teams will play in a game. Among those four the highest ranked team will host the lowest ranked of the four in one game while the other game will be hosted by the second highest ranked of the four playing the second lowest ranked of the four. Home team all depends on ranking, it is completely possible for a wild card team to be higher ranked then a division winner. Keep in mind qualification for the conference championship is based on in division record. It is possible for a team to have a better overall record then two other teams in their own division. Now after those first two rounds we will be down to just 4 teams. Now we should be getting to about the new year on the calendar. Of the remaining teams, they will again be pitted against one another based upon ranking. Top ranked takes on lowest ranked and second highest ranked takes on second lowest ranked. Now these games will be played as part of the bowl series. A series of bowl games will revolve through. Because there are two games in this round each bowl will get to host one for two years in a row. 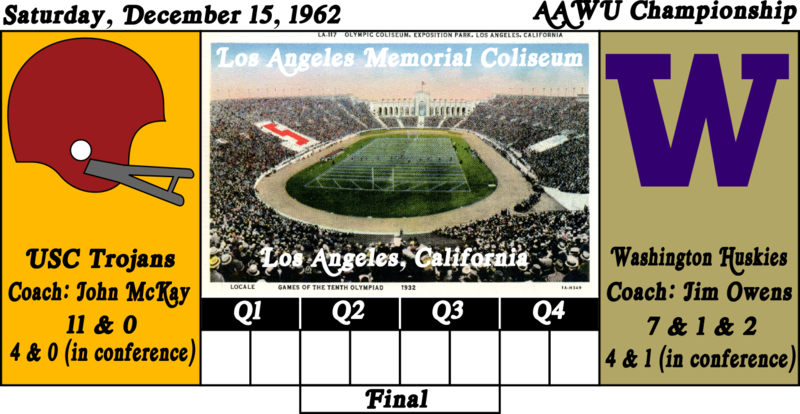 They will be offset however so let us say one year the Rose Bowl, in their second year, and the Sugar Bowl, in their first year, are hosting. 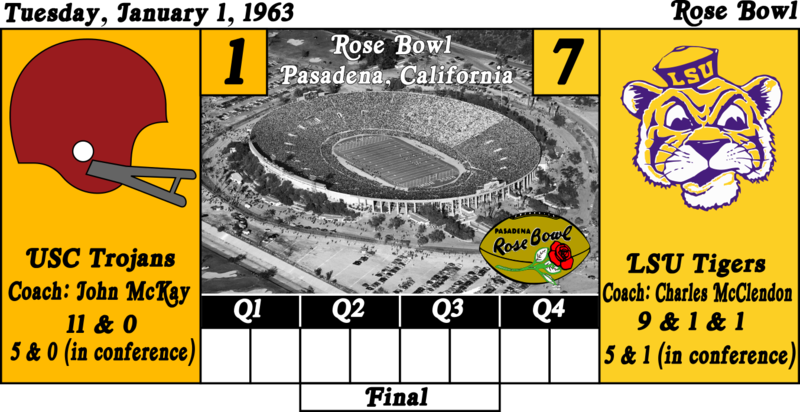 The next year the Rose Bowl will step aside while the Sugar Bowl hosts for second year and a new bowl game will be inserted, say perhaps the Orange Bowl, in their first year. 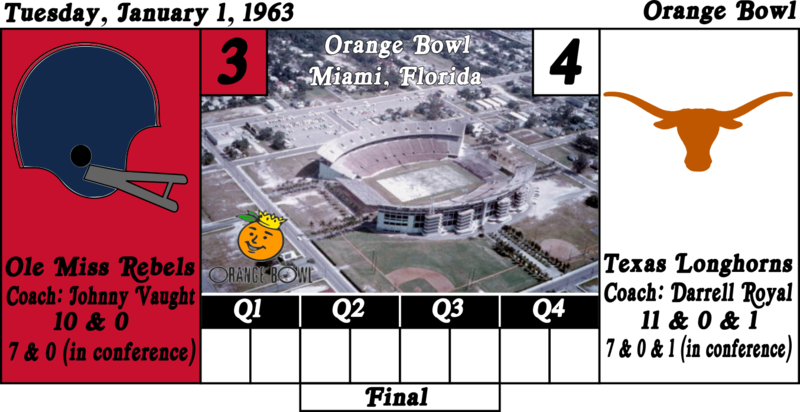 For the inaugural year the Orange Bowl and the Rose Bowl have been selected. Finally, now we will be in our fourth round. The National Championship Game. It will be played at a predetermined location selected by a popular vote from amongst nominated host venues. The winner of this game will be named the years National Champion. New York City has been selected as the site of the first National Championship by the committee. The game will be played at Yankee Stadium. The process of voting for the coming locations will be a five-year process so with the first nominations for five years from now coming out this season, thus the first four host locations will be selected by the committee. Hope this is not all too confusing. I am sure it will become easier to follow as we get rolling. So, with no further ado lets travel back in time to 1962 and find out who will be playing in the power conference championship games. Might want to fix your images. The point difference in this one was 13 points. It was enough to show that USC was the convincing better team. However most of their scoring was done in the first quarter. In some ways they seemed to coast the rest of the way through relying on their defense. On their opening drive USC kicked a 36-yard field goal to take an early 3-0 lead. The Huskies responded strong. On their follow, up drive the Huskies responded well marching down the field for a 27-yard pass for a touchdown. They would take the lead 7-3. On the next drive the Washington Huskies defense had USC stalled but then came a trick play that resulted in a 65-yard pass for a touchdown. Now USC had the lead back at 10-3 and the play felt like a momentum shift that would endure through the game. Washington got the ball back and made a couple plays but then Damon Bame caught an interception and ran it back 41 yards for a USC touchdown. Thus, the first quarter ended with USC up 17-7. On their first drive of the second quarter USC was lead down the field in a drive that ended with a 3-yard run for a touchdown. Now the Trojans lead 24-7. The moment of opportunity for Washington came a drive latter. They were stalled and looked like they were about to be forced to punt when they went for it and got a 68-yard pass for a touchdown. Now the score was 24-14. It was at this point that USC showed what might appear to be a lack of caring. They had an ugly ensuing drive that luckily for them did end with some points, those coming from a 14-yard field goal. Now the score was 27-14. After a couple short drives by each team Washington drove down the field on the final drive of the quarter and ended with a 11-yard pass for a touchdown. With little time left they punted the ball back to USC who just ran out the clock on the final play of the half. Thus, USC went into halftime with a lead of 27-21. Washington had outscored them in the second quarter. The second half became more of a defensive stand by USC. On their second drive of the third quarter, USC did head down the field and eventually score a touchdown on a 7-yard run by Ben Wilson. The lone lapse of the USC defense in the second half came on the following drive when Washington orchestrated a drive that ended on a 20-yard pass for a touchdown. That would be the final scoring play of the third quarter and it left the total at 34-28 USC leading. The fourth quarter was an even more dominating performance by the USC defense. Washington to was strong on defense in the quarter but playing from behind they were much more desperate as time wore down. Late in the quarter USC had one good drive that ended in another short yard run by Ben Wilson that resulted in a touchdown. That was the final score of the game. USC came away with the win 41-28. Alabama scored first in this one a few drives into the game on a 2-yard run. This gave them the first lead of the game at 7-0. After a pair of 3 and outs, 1 for each team, Ole Miss got the ball back just before the end of the quarter. They drove down the field and got a touchdown of their own on a 12-yard pass. With the PAT they evened the score 7-7 just before the end of the quarter. Again, Alabama came strong into the second quarter of the game. On their first drive of the quarter they got a touchdown on a 29-yard pass. This put them up 14-7. Their defense would put the squeeze on Ole Miss and after just a short drive by the Rebels, Alabama got the ball back. They made their way down the field again and nearly had a touchdown but the ball was intercepted at the 1-yard line. Ole Miss felt they now had some momentum but after just a couple plays their quarterback was tackled in the end zone for a safety that put Alabama up 16-7. Just as it felt Alabama might be pulling away an upset they fumbled the ball on an ensuing drive. Their defense would prevent Ole Miss from making any real field gains but the Rebels were able to kick a field goal and bring the score to 16-10. Then it was the Ole Miss defense that would make a strong showing forcing Alabama to a 3 and out. After an Alabama punt the Rebels moved down the field again but once more were only able to pick up a field goal. They had closed Alabama’s lead however to just 3 points right before the half. The score was now 16-13. The Crimson Tide came out in the second half still holding the momentum. On their first drive of the half they were able to pick up a 47-yard field goal to take their lead back up to 6 points at 19-13. Ole Miss would get the ball back but were forced to punt after just 3 plays for no gain. Punting the ball away themselves they had Alabama pushed back deep. Then following a couple penalties Alabama found their backs pushed right up against their own goal. With pressure coming in a blitz Alabama’s quarterback scrambled only to fumble the ball. As it rolled into the end zone Ole Miss jumped on the ball and scored a touchdown of their own that suddenly tied the game. With a PAT they took the lead at 20-19. The turn in events appeared to take the wind out of Alabama. 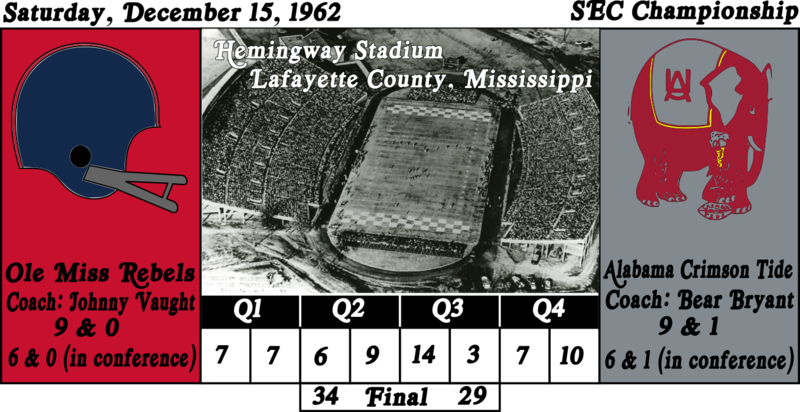 They could not move the ball at all on their next possession and in turn allowed Ole Miss to carry itself down the field on the final drive of the third quarter, resulting in a 25-yard touchdown pass. That put Ole Miss up 27-19 with a quarter to go. To open the fourth quarter the Crimson Tide got a 19-yard field goal that cut the lead to 5 points. After a couple short drives from each team Ole Miss got the ball with good field position and marched the ball right up to the goal line. On a short 1-yard pass on 3rd and goal they scored a touchdown that put them up 34-22. Alabama would make one more strong drive resulting in a touchdown of their own on a 10-yard pass that brought the score to 34-29. That is where the scoring would finish. With a couple more short drives dominated by defenses the game came to an end and Ole Miss carried the day to victory. My question is, how were you able to get the logos for this? Did you swipe them from the site? And for those that you couldn't get, was it because the school didn't have an official logo at the time? So yes, as best I could I have researched what the logo was at the time. When no real logo existed I have used the helmet used by the team at the time. To get an idea of what those looked like I looked up images of the team for the time. As for how did I get the logos, I drew them myself, using several ones I found in an image search as reference. This one is an upset. Somehow the Minnesota Golden Gophers are going to the wild card round and are now the Big 10 champions. It all started early for them. Wisconsin had the ball first but after getting only 1 first down the Badgers were forced to punt. Minnesota came rolling strong and efficiently down the field. Then just over mid field they went for a big play and got a touchdown on a 47-yard pass. The games first score put the Golden Gophers up 7-0 with the ensuing point after. After that trilling start things settled down for both teams through the middle of the first quarter. Finally, late in that opening frame Wisconsin was able to move the ball down the field themselves. However, they were forced to settle for a 35-yard field goal that put their first points on the board but still left them trailing 3-7. The Second quarter of this game would be a touchdown explosion. Every team scoring on every drive. First the Golden Gophers worked down the field resulting in a 10-yard pass for a touchdown. This put them up 14-3. Wisconsin would respond. They came down the field themselves and ended their drive on a 8-yard run for a touchdown that brought the score to 14-10. Again, Minnesota came with a drive of their own. This one ending in a 17-yard pass for a touchdown that put the score at 21-10. 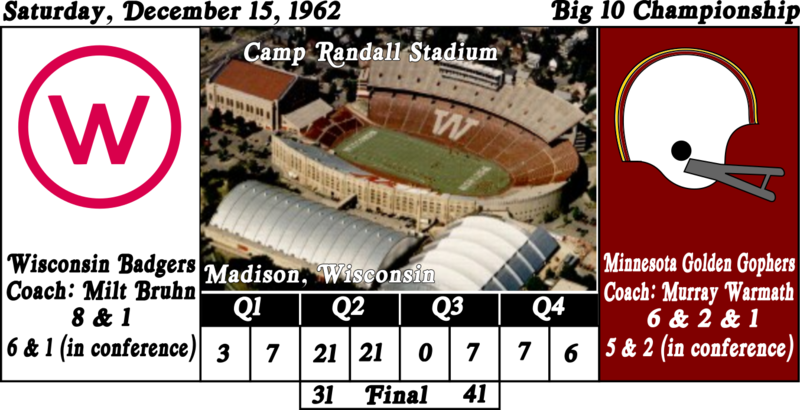 The next drive was not so easy for the Wisconsin Badgers. Minnesota nearly had them stalled but then they got a big 53-yard pass and run that resulted in a touchdown, bringing the score to 21-17. With much more ease the Minnesota Golden Gophers marched back down the field themselves and ultimately got a 7-yard pass for another touchdown, that brought the score to 28-17. Again, Wisconsin had a hard time moving the ball and just as it seemed they were going to run out of time they got an even bigger pass and run play, this one totaling 60 yards and likewise resulting in a touchdown. So, going into the half the score was brought to 28-24. After the explosive second quarter the only points in the third quarter came in the middle of the frame. It was on a Minnesota drive that ended in a 20-yard pass for a touchdown. This put the Gophers ahead now 35-24. To open the fourth quarter Wisconsin pushed to make something happen. The drove down the field and scored a touchdown on a 16-yard pass. This brought them back within 4 points with most of the fourth quarter still ahead. However, that was the last offensive strength they could muster. A couple drives later the Gophers had the ball again and they once again worked their way down the field to score a touchdown on an 8-yard pass. They failed on the point after kick however. This was the final scoring play of the game. So, from here time was worn down as Wisconsin desperately tried to make something happened before they found themselves on the losing side of an upset, 31-41. The first quarter of this affair was a scoreless mess. No one could seem to hold onto the ball. The quarter saw 6 turnovers, 3 from each team. Putting the awful first quarter behind them Oklahoma opened the second quarter with a drive that ended in a 1-yard pass for a touchdown. This put the Sooners ahead 7-0. In the first quarter every miserable mistake that Oklahoma made was matched by the Missouri Tigers. 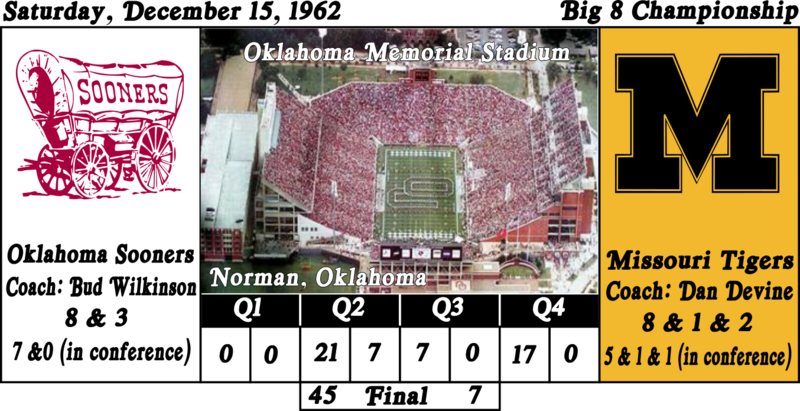 Now as the second quarter got underway the Tigers were able to match the positives of the Sooners. On their first drive of the second frame resulted in their own touchdown. This evened the score at 7. When Oklahoma got the ball back they kept the positives rolling. Making their way down the field they were able to break through on a 22-yard run that ended in another touchdown. Once again, they were up by 7, 14-7. This time Missouri could not match them. After only 7 plays the Tigers were forced to punt. Getting the ball back into their hands the Oklahoma Sooners developed an impressive drive that ended on a 21-yard pass for a touchdown. Now as the first half was nearing an end the Sooners had a 21-7 lead. The third quarter, like the first, was pitiful. The only scoring drive came about 2/3 of the way through the quarter. Oklahoma scored on a 1-yard run and built their lead to 28-7. The Oklahoma Sooners were impressive in the fourth and final quarter. They held the ball for most of the quarter. Their defense kept any Missouri drive short. On three of their own drives the Sooners would score. The first score was the end result of their second drive of the quarter. It came on another 1-yard run for a touchdown and pushed the score to 35-7. On their next possession they drove down and settled for a field goal that put them up 38-7. After punting the ball away to the Tigers, Oklahoma wound up getting the ball back shortly thereafter on an interception. The Sooners capitalized on the turnover by taking the ball down for another touchdown. This built the lead to 45-7. That is where matters would end as far as scoring. The Oklahoma Sooners win big in a blowout victory over the Missouri Tigers. The defenses of each team were controlling this game early on. Neither team could seem to get anything going. 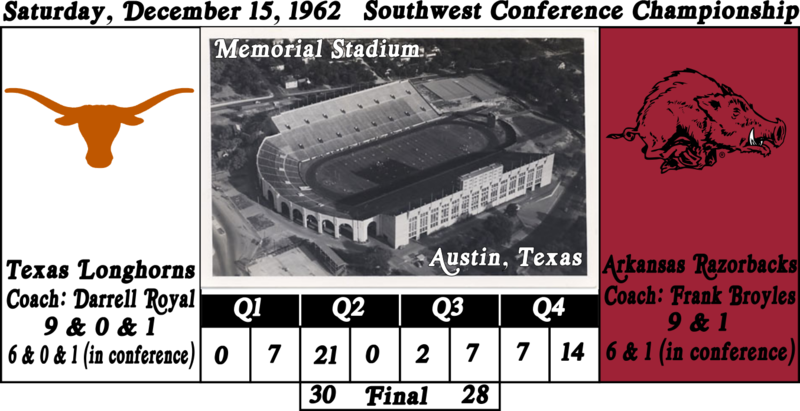 Then finally on the final drive of the quarter the Arkansas Razorbacks were able to put some points up on the board on 29-yard play that resulted in a touchdown. So, the first quarter would end with the Razorbacks leading 7-0. On their first drive of the second quarter the Texas Longhorns offense would come to life. They marched down the field ending on a 16-yard run for a touchdown. With that the game was tied 7-7. They would force Arkansas to punt the ball after just three plays. With the ball back, the Longhorns were able again to march down the field and score, this time on a 38-yard pass. This put them up 14-7. Arkansas would march down the field. They got to a first and goal but then they fumbled the ball. Texas scooped it up and ran it back 29 yards. The Longhorns offense would carry the ball the rest of the way down the field and again score a touchdown, this time on a 16-yard pass. Now going into half-time the Longhorns were up 21-7. Arkansas scored first in the second half. It came midway through the third quarter on an efficient drive that ended in a 2-yard run for a touchdown. With that the Arkansas cut Texas’ lead to 7 by making it 21-14. The quarter would end on a strange play where Arkansas with the ball was backed up to their own goal. From the end zone the quarterback was able to complete a 10-yard pass but a holding penalty was called against the Razorbacks resulting in a safety. With that the Longhorns would get 2 more points and go up 23-14. Interestingly enough 2 points would in the end be the difference in the final score. Just as they had to start the third quarter, Arkansas came strong into the fourth quarter. They scored on their opening drive of the final quarter. This brought the score to 23-21. Texas’ lead was down to just 2 points and Arkansas was looking strong. 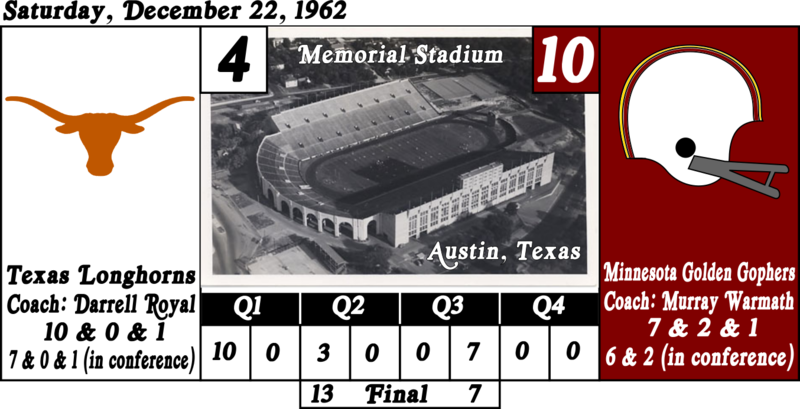 A couple drives later however the Longhorns were able to complete their own scoring drive with a 3-yard run for a touchdown. Now they were up 30-21. Arkansas drove down the field late and scored one more time and once more brought the total to 30-28. That would be the final score. Arkansas made an attempt at an onside kick but the ball bounced out of bounds before anyone could recover it. Texas ran out the clock and escaped with a 2-point win in a game where they were outscored in 3 of the 4 quarters. The committee comes out with the top ten rankings. It is determined that the rankings will in be made in before even the conference championship games beginning next year. That is because the process felt somewhat confusing to the committee. Their end result was a bit confusing as well since despite their upset loss the Badgers were still ranked number 2. As for the wild card, it will go to the #7 ranked LSU Tigers. So, with these results the USC Trojans and Ole Miss Rebels will have byes through the wild card round. While the two games will be #10 Minnesota Golden Gophers at #4 Texas Longhorns and #8 Oklahoma Sooners at #7 LSU Tigers. This game started on a pair of defensive stands, one from each team. On the third drive of the game Oklahoma had the ball and they drove down the field. They ended on a 7-yard run for a touchdown that gave them the first score and lead of the game. That lead 7-0. With their offense up and running their defense proceeded to let the team down on the ensuing drive. Penalties on the Sooners defense allowed LSU to keep a drive of their own alive. However, LSU was forced to settle for a field goal of 23 yards that gave them their first points. The score was now 7-3. Back would come Oklahoma. They would get one more scoring drive in before the end of the quarter. This drive ending on a 28-yard pass for a touchdown. With the point after Oklahoma now found themselves up 14-3. The quarter would end as LSU was driving down field. 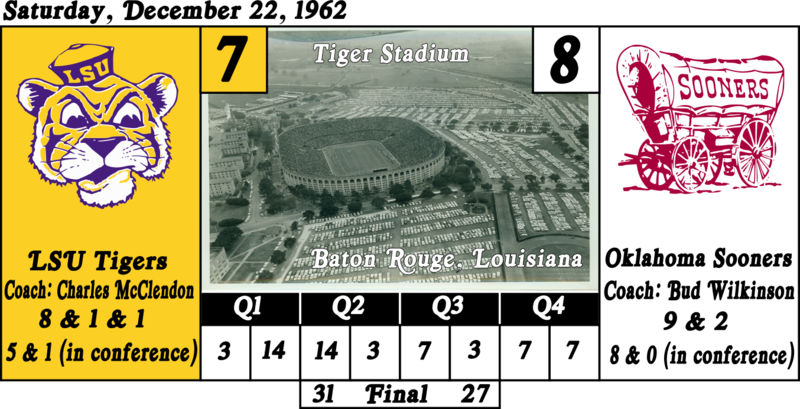 Into the second quarter it did not take long for LSU to score their first touchdown. They got it on an 11-yard pass. This brought the score to 14-10. The next couple drives were ended by the defenses of each team. Then Oklahoma got the ball back and worked their way down the field. When the Tigers defense stalled this Sooner drive, Oklahoma was forced to settle for a field goal bringing the score to 17-10 in favor of Oklahoma. This was a key moment for LSU. They now had an opportunity to catch the Sooners. However, it looked as if the Sooners defense was going to prevent LSU from scoring again but then came a 58-yard passing play that ended in the end zone with a touchdown for the Tigers. This brought the score to a tie at 17. On the final couple of drives of the half both defenses held their opponents from moving much and the half ended with an even score. LSU had the ball to start the second half. They got into Oklahoma’s territory but then turned the ball over on a fumble. LSU’s defense would force the Sooners to settle for a 33-yard field goal. This put Oklahoma back in front on the score board at 20-17 but preventing the touchdown would prove to be critical for the Tigers. LSU would respond but not right away. It was a few drives later when they had the ball that the Tigers put together a drive that ended on a 27-yard pass for a touchdown. This put them up for the first time in the game at the score of 24-20. That would be it for the scoring in the third quarter. Oklahoma could not get anything going in the early part of the fourth quarter. 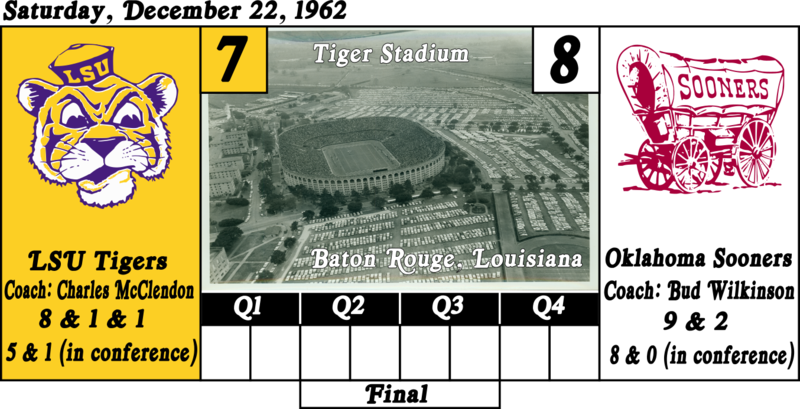 LSU for the most part could not either on their first possession of the quarter but then on their second they made their way down the field until they scored another touchdown on a 16-yard pass. This put them up 31-20. The defenses of each team would seemingly take control of the tempo of the game. That was until Oklahoma was able to break out for a touchdown after a nice drive that ended on a 1-yard run. This brought the score to 31-27. As the game played out on a couple more possessions (1 for each team) the defenses once again commanded the tempo. The clock was run down and LSU found themselves the victors. Minnesota has been the surprise of these playoffs. This game might turn out to be the surprise of the playoffs. Not because it was a great game or a stunning upset. Rather because it was for the most part controlled by the defenses. The winning team did not even score in the second half of the game. In total the game only had 4 scoring drives and 2 of those came in the first quarter. It was already late in that quarter when Texas was able to get a 14-yard field goal that put the first points on the board giving them the 3-0 lead. It appeared there would be no more scoring in this quarter until Texas returned an interception 27 yards for a touchdown that gave them a 10-0 lead at the end of the quarter. The second quarter was as much, if not more of a defensive affair. The lone scoring play came about midway through the quarter when the Longhorns got another field goal and put themselves up 13-0. That is where the score stood at half time. The only score of the second half would come on just 4 plays into the quarter. Minnesota completed a 46-yard pass for a touchdown and put themselves on the board, 13-7. That was it in the game for scoring. That would stand as the final score. The fourth quarter was a back and forth of defensive stops. Only once would a Texas get into Minnesota territory. Minnesota never got into Texas territory. So that was it the game ended with a low score of 13-7.